We rented both the omg and owow villas. We were 18 ppl (including kids). Omg has breathtaking views. The staff is great, They take care of every small things and no matter what time of is they will be happy to serve you. Yati ( the main caretaker of the properties) is very organized and so his her staff. Managing our group of 18 with so many different needs will drive anyone crazy but the staff knew how to take care of everyone's needs and they made it look so easy. I have never come across a staff that is this good. They make the vacation worth it. The breakfast was great everyday and has a lot of options The drivers (Romi) knew every part of Bali and guides you to the best places. We used to hang out late and his shift gets done at 9pm but he made sure he took us wherever we wanted, even if it was midnight and he had to stay longer. Thank you for the exceptional service and making our trip so memorable. The property, the pool, the food & butler namely (Jimy), very much thanks to her. The villa was enormous and all the rooms had a great view. I was pleasantly surprised that the booking came with a butler who was very nice and efficient. She took care of all our needs and spoke good English. The view of the property was amazing and the pool was in a perfect place. The food was also delicious. Since we traveled with 3 senior citizens the staff were very patient and attended to all their needs. They also had wifi which was enough to just stay connected and prevent you from doing any work. The wait staff was amazing! The view and surrounding environment is beautiful! The villa is gorgeous! The property is beautifully designed and located by the beach so the view is stunning. The service is good by friendly staff. The view was amazing. The service was amazing - our host was friendly and nothing too much trouble. The villa is a little tired however all that can be overlooked when you are enjoying the pool and the view. The view is spectacular. The staff very welcoming and accommodating. Lock in a great price for The Asmara Nusa Dua – rated 8.4 by recent guests! The Asmara Nusa Dua This rating is a reflection of how the property compares to the industry standard when it comes to price, facilities and services available. It's based on a self-evaluation by the property. Use this rating to help choose your stay! One of our top picks in Nusa Dua.The Asmara Nusa Dua features luxurious villas and private infinity pools. It provides free WiFi and 24-hour butler services. 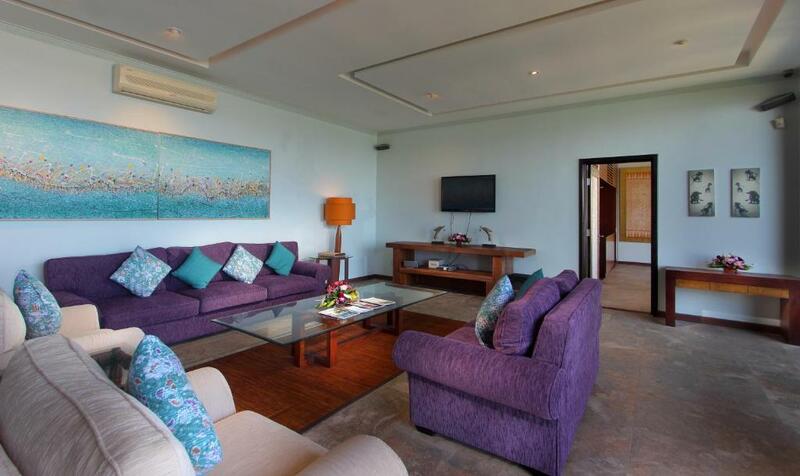 The spacious villas feature large living rooms equipped with a 42-inch flat-screen TV and DVD player. Home-made meals can be prepared in the well-equipped kitchen. Beautiful sea views can be enjoyed from the sun decks and balconies. The Asmara Nusa Dua is a 5-minute drive from Nusa Dua Golf and Country Club. It is a 10-minute drive from BTDC Nusa Dua Complex and restaurants at Nusa Dua Bali Collection. The nearest airport is Ngurah Rai International Airport, a 40-minute drive away. Guests can relax with a massage by the pool, rent a car to explore or organize a casual gathering at the barbecue facilities. DVDs and magazines can be borrowed for free from the hotel's library. 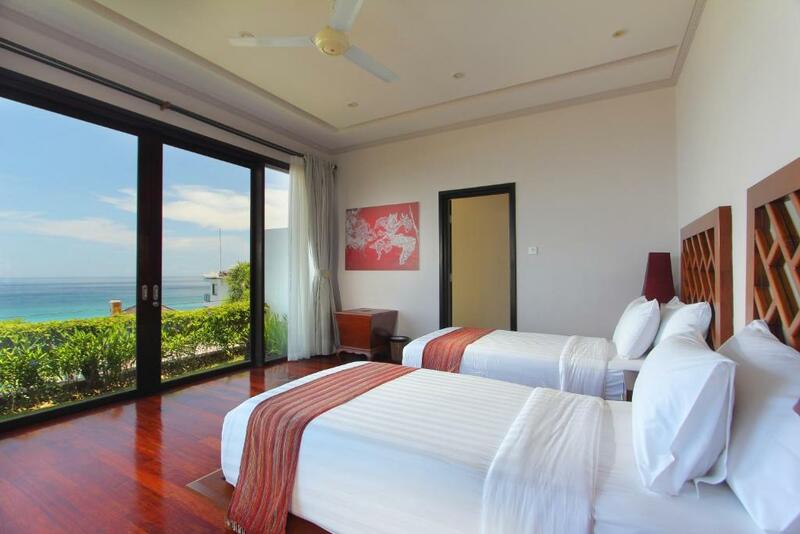 This property is also rated for the best value in Nusa Dua! Guests are getting more for their money when compared to other properties in this city. When would you like to stay at The Asmara Nusa Dua? Spacious 4-bedroom villa comes with an infinity lap pool. The large living room is equipped with a 42-inch flat-screen TV and home theater system. It includes a fully equipped kitchen and dining area. Barbecue facilities can be provided by request, in-room dining is also available. Featuring a private balcony overlooking the sea, this villa has a well equipped kitchen, dining area and a living room. 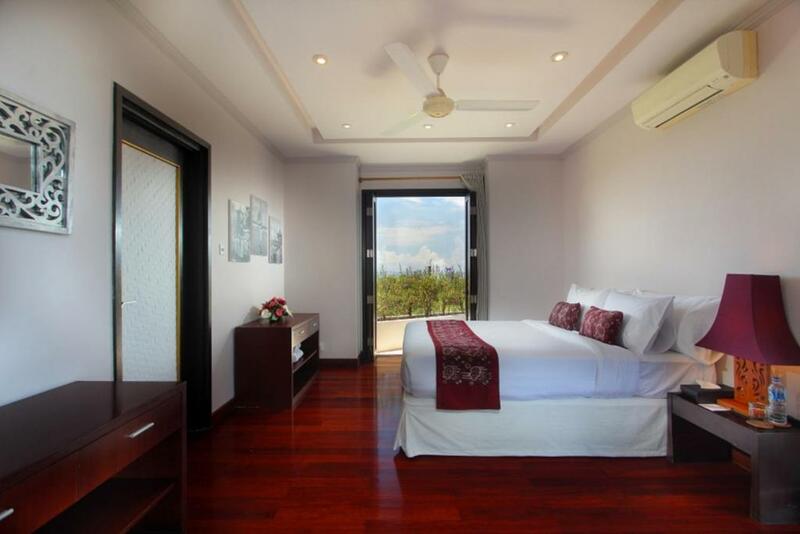 Each air-conditioned bedroom has a private bathroom with bath and shower facilities. A private pool and a wooden sundeck with a gazebo are also available. Includes a fully equipped kitchen and dining area. Barbecue facilities can be provided by request, in-room dining is also available. The Asmara Nusa Dua provide 24 hours butler service, free return airport transfer arranged for those who staying minimum of 3 nights stay. Has been in hospitality industry since 2005. Love shopping and cooking so much. 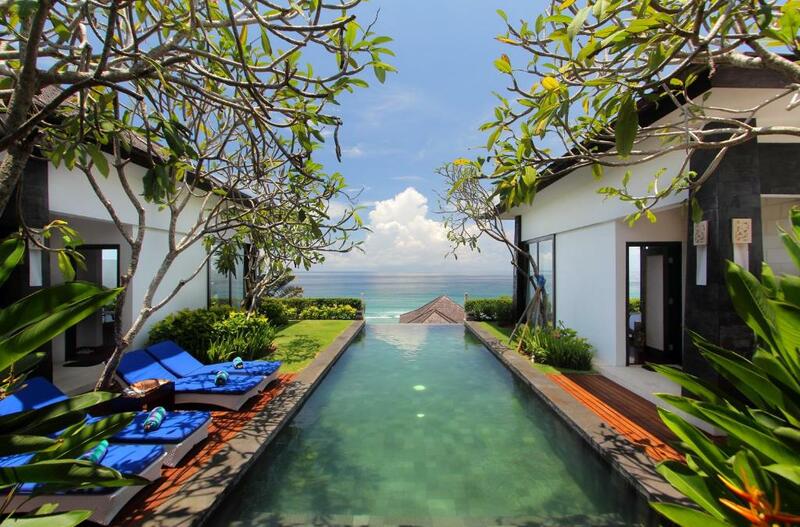 Villa located facing Indian Ocean and has own private acces to the beach. All beautiful beaches are near from our Villa, Pandawa Beach, Geger Beaches, Nusa Dua beaches or Uluwatu . House Rules The Asmara Nusa Dua takes special requests – add in the next step! Any additional older children or adults are charged IDR 500000 per night for extra beds. The Asmara Nusa Dua accepts these cards and reserves the right to temporarily hold an amount prior to arrival. 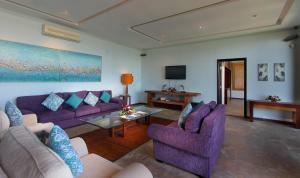 Guests staying for a minimum of 3 nights enjoy free return airport transfer. Please inform The Asmara Nusa Dua of your expected arrival time in advance. You can use the Special Requests box when booking, or contact the property directly using the contact details in your confirmation. A damage deposit of IDR 3000000 is required upon arrival – that's about 213.60USD. This deposit is fully refundable at check-out as long as there's been no damage to the property. 1、kitchen cleanliness is poor. 2、the location is too remote. 3,the road outside the hotel is too bumpy. The room is spacious and comfortable. There is hardly anything you can complain about. There are a couple of minor things as others have mentioned ( road leading to villa is not so good) but the service these guys provide makes you forget all those minor issues - which does not usually happen at other places. Seaside properties are hard to maintain, and this one is showing some wear. The road to reach the property as well as the way to go to the beach. Service of butler was amazing,ambience wss beautiful,breakfast served was fresh, view from property was breathtaking,paragliding station was nearby and was a safe and exciting experience. It's a hidden gem which means it's quite far from anything else and 3G/LTE doesn't work. We were surprised that we were not given a key and there wasn't anything to sign for check-in which meant we were not sure how to keep our valuables. The villa also need some repairs - room door didn't open/close easily and the bathroom drainage in one of the rooms took an hour to drain. We were quite surprised to see monkeys swim in our pool on our third so we were not sure how the pool was kept clean. The only thing I had an issue with was two of the bathrooms on the property had an awful smell. They tried their best to freshen the smell, but wouldn't go away. The only other suggestion would be the time of the food when it was brought out. Seemed to take a while but we also had a big group. Other than that, the trip was amazing! The staff was amazing! I went with a group of girls to celebrate my birthday and the staff made it so special. They were patient, and fun to talk to. Also the location is BEYOND BEAUTIFUL!!!!!! We had such a great time when we were there. The upkeeping of the property needs some attention and improvement. We very much liked the space and the location - very quiet, peaceful with breathtaking views. The pool is great and the staff is very friendly, accommodating and flexible with extra requests for food etc. The property needs renovation and the bathrooms and hot water system was poor. Leakages from the roof were noted and the pool was poorly maintained. Houseflies, cockroaches, lizards and other pests were abundant.